As expected, the Kanon remake is much the same as its predecessor but with much nicer art. Yuuichi definitely looks better now that he’s less deformed, even if he looks, acts and speaks almost exactly like Kyon from Haruhi Suzumiya. For some reason, having watched the original series makes me feel like a fanboy, and picking up the little cameos in ep. 1 made it lots of fun – but I’m sure in a few eps I’ll remember just how bored the series made me and how goofy it becomes. 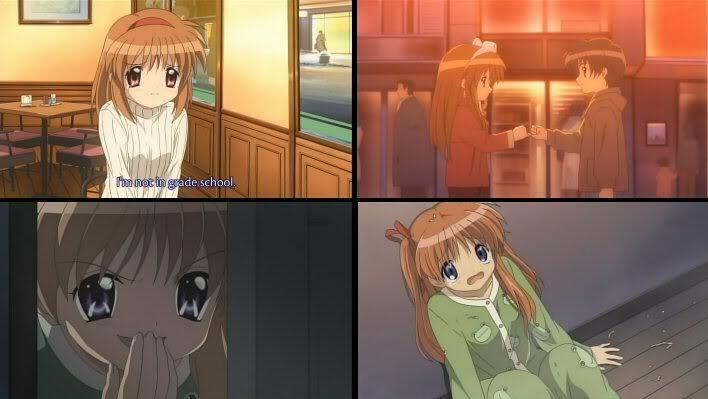 A little while back, I reviewed the original 13-episode Kanon series, and today reached the end of the Kyoto Animation remake. I have to say, my reaction to this new version was far more positive than it was to the original, even though the same flaws were present. It wasn’t just that the art and animation were far more appealing, Kyoto Animation being far abler to pull off Key’s extreme art style without the cast looking deformed, either. Being 24 episodes rather than 13, this new Kanon was given more time to breathe and develop its characters. Yuichi in particular is less bland, given a wry sense of humour probably influenced by Kyoto Animation’s previous protagonist, Kyon from Suzumiya Haruhi no Yuuutsu. Yuichi’s sole male friend is either a new character or actually gets something to do, and the swing from one girl to the next is not quite so jarring, since storylines get more of a sense of conclusion – though jar they still do, Yuichi going through traumatic experiences that are soon forgotten. And yes, familiarity with the more ridiculous supernatural elements meant my proclivity to decry them was somewhat assuaged. But stupid bits are still stupid bits, supernatural guff is supernatural guff and girls who fight ghosts that are most definitely not explicable in rational ways, even if their nature isn’t quite as it would seem, are still just that. Kanon has heaps of absurdity, and none of it works in favour of the story. This time around, though, the same voice actors seemed much more likeable, much less whiney. I suppose it’s simply because they seemed to fit their appearances better, no longer looking like they had some otherworldly deformations. And yes, the art and animation were pretty stunning. But in the end, an anime that stuffs in the main storylines of all the girls of a dating sim/visual novel, one by one finding flimsy reasons to abort romances, and still seems rushed at the end, cannot be counted a success. But oh my, was it nice on the eyes, and oh, were those girls cute, especially Makoto.